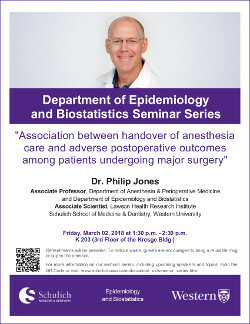 "Association between handover of anesthesia care and adverse postoperative outcomes among patients undergoing major surgery"
Dr Jones is Associate Professor in the Departments of Anesthesia & Perioperative Medicine and Epidemiology & Biostatistics. His clinical practice is specialized in cardiac anesthesia and liver transplantation. He is Associate Editor of the Canadian Journal of Anesthesia. His research in perioperative medicine employs pragmatic randomized clinical trials, systematic reviews, and observational studies to address clinically relevant questions.